The Apostle Paul is a major figure in the New Testament. He is the author of 13 of the 29 books found in the New Testament. His importance cannot be overstated. His life and activities make up a major portion of the book of Acts, and he was one of the key shapers of early Christianity. Such is the significance of Paul. Here I offer 70 books looking at various aspects of his life, his teachings, and his theology. As is always the case with my bibliographies and Bible study tools, I am admittedly being rather selective in the volumes I offer. There are of course far too many works to be chosen from in relation to Paul, so some limitations have become necessary. Thus the books found here mainly represent a conservative and/or evangelical point of view, and they mostly come from the past half century or so. Barnes, Peter, The Gospel: Did Paul and Jesus Agree? Evangelical Press, 1994. Barrett, C.K., Paul: An Introduction to His Thought. Westminster/John Knox Press, 1994. Beck, James, The Psychology of Paul: A Fresh Look at His Life and Teaching. Kregel, 2002. Beker, J. C., Paul the Apostle. Fortress, 1980. Bird, Michael, Introducing Paul: The Man, His Mission and His Message. IVP, 2008. Bird, Michael, ed., Four Views on the Apostle Paul. Zondervan, 2012. Bolt, Peter and Mark Thompson, eds., The Gospel to the Nations: Perspectives on Paul’s Mission. Apollos, 2002. Boyd, Robert, Paul the Apostle. Word, 1995. Bruce, F.F., Paul and Jesus. Baker, 1974. Bruce, F.F., Paul: Apostle of the Heart Set Free. Eerdmans, 1977. Dodd, Brian, The Problem with Paul. IVP, 1996. Dunn, James, The New Perspective on Paul, rev. ed. Eerdmans, 2007. Dunn, James, The Theology of Paul the Apostle. Eerdmans, 1997. Fee, Gordon, God’s Empowering Presence: The Holy Spirit in the Letters of Paul. Hendrickson, 1994. Fee, Gordon, Paul, the Spirit, and the People of God. Hendrickson, 1996. Gorman, Michael, Apostle of the Crucified Lord: A Theological Introduction to Paul and His Letters. Eerdmans, 2004. Gundry-Volf, Judith, Paul and Perseverance: Staying in and Falling Away. Westminster/John Knox Press, 1991. Hafemann, Scott, Paul, Moses, and the History of Israel. Hendrickson, 1995. Hafemann, Scott, Paul’s Message and Ministry in Covenant Perspective: Selected Essays. Cascade Books, 2015. Harvey, John, Interpreting the Pauline Letters: An Exegetical Handbook. Kregel, 2012. Hawthorne, Gerald, Ralph Martin and Daniel Reid, eds., Dictionary of Paul and His Letters. InterVarsity Press, 1993. 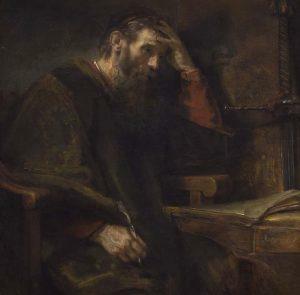 Hays, Richard, The Conversion of the Imagination: Paul as Interpreter of Israel’s Scripture. Eerdmans, 2005. Hays, Richard, Echoes of Scripture in the Letters of Paul. Yale University Press, 1989, 1993. Kim, Seyoon, Paul and the New Perspective: Second Thoughts on the Origin of Paul’s Gospel. Eerdmans, 2002. Kruse, Colin, Paul, the Law, and Justification. Apollos, 1996. Longenecker, Bruce and Todd Still, Thinking through Paul: A Survey of His Life, Letters, and Theology. Zondervan, 2014. Longenecker, Richard, The Ministry and Message of Paul. Zondervan, 1971. Longenecker, Richard, ed., The Road From Damascus. Eerdmans, 1997. MacArthur, John, The Gospel According to Paul: Embracing the Good News at the Heart of Paul’s Teachings. Thomas Nelson, 2017. McKnight, Scot and Joseph Modica, eds., The Apostle Paul and the Christian Life: Ethical and Missional Implications of the New Perspective. Baker, 2016. McRay, John, Paul: His Life and Teaching. Baker, 2003. Machen, J. Gresham, The Origin of Paul’s Religion. Eerdmans, 1925, 1976. Matera, Frank, God’s Saving Grace: A Pauline Theology. Eerdmans, 2012. Pate, C. Marvin, The End of the Age Has Come: The Theology of Paul. Zondervan, 1995. Pohill, John, Paul and His Letters. Broadman and Holman, 1999. Reymond, Robert, Paul: Missionary Theologian. Christian Focus, 2000. Ridderbos, Herman, Paul: An Outline of His Theology. Eerdmans, 1975. Riesner, Rainer, Paul’s Early Period. Eerdmans, 1998. Rosner, Brian, ed., Understanding Paul’s Ethics. Eerdmans, 1995. Sanders, E.P., Paul, the Law, and the Jewish People. Augsburg, Fortress Press, 1983. Sanders, E.P., Paul and Palestinian Judaism. Fortress Press, 1977. Schlatter, Adolf, The Theology of the Apostles. Grand Rapids: Baker, 1998. Schreiner, Thomas, Interpreting the Pauline Epistles. Baker, 1990. Schreiner, Thomas, The Law and it’s Fulfillment: A Pauline Theology of Law. Baker, 1993. Schreiner, Thomas, Paul: A Pauline Theology. IVP, 2001. Seifrid, Mark, Christ, Our Righteousness: Paul’s Theology of Justification. IVP, 2001. Seifrid, Mark and Randall Tan, The Pauline Writings: An Annotated Bibliography. Baker, 2002. Strickland, Wayne, ed., The Law, the Gospel, and the Modern Christian: Five Views. Zondervan, 1993. Stuhlmacher, Peter, Revisiting Paul’s Doctrine of Justification: A Challenge to the New Perspective. IVP, 2002. Strom, Mark, Reframing Paul. IVP, 2000. Thielman, Frank, Paul and the Law. IVP, 1994. Thiselton, Anthony, The Living Paul. An Introduction to the Apostle’s Life and Thought. IVP, 2009. Twelftree, Graham, Paul and the Miraculous. Baker, 2013. Vickers, Brian, Jesus’ Blood and Righteousness: Paul’s Theology of Imputation. Crossway Books, 2006. Vos, Geerhardus, The Pauline Eschatology. Princeton University Press, 1930. Waters, Guy Prentiss, Justification and the New Perspective on Paul. Presbyterian and Reformed, 2004. Wenham, David, Paul: Follower of Jesus or Founder of Christianity? Eerdmans, 1995. Westerholm, Stephen, Israel’s Law and the Church’s Faith: Paul and His Recent Interpreters. Eerdmans, 1988. Westerholm, Stephen, Perspectives Old and New on Paul: The “Lutheran” Paul and His Critics. Eerdmans, 2003. Westerholm, Stephen, Preface to the Study of Paul. Eerdmans, 1997. Westerholm, Stephen, Understanding Paul, 2nd ed. Baker, 2004. Witherington, Ben, The Paul Quest. IVP, 1998. Witherington, Ben, Paul’s Narrative Thought World. Westminster/John Knox Press, 1994. Witherington, Ben, A Week in the Life of Corinth. IVP, 2012. Wright, N. T., The Climax of the Covenant: Christ and the Law in Pauline Theology. Fortress, 1994. Wright, N. T., Justification: God’s Plan and Paul’s Vision. SPCK, 2009. Wright, N. T., Paul: A Biography. HarperOne, 2018. Wright, N. T., Paul and the Faithfulness of God, 2 vols. Fortress Press, 2013. Wright, N. T., Paul and His Recent Interpreters. Fortress Press, 2015. Wright, N. T., Paul: In Fresh Perspective. Fortress Press, 2006. Wright, N. T., What Saint Paul Really Said. Lion, 1997. With so many books listed here, the average reader may feel a bit overwhelmed. While I can endorse all the authors and books featured here, let me try to highlight just a few of the authors who are pretty much guaranteed to offer reliable and useful help in understanding Paul, even if one may not agree with every detail. They would include Bruce, Fee, Longenecker, Rosner, Schreiner, Witherington and Wright. There are a lot of books featured here, reflecting a whole lot of scholarship, thinking, research and writing. If you take all the articles I have penned – and will pen – in this series on “Bible Study Tools” you will likely have well at least a thousand volumes all up. Many might wonder if all this is simply overkill. A fair point. Theological discussion simply goes on and on. Is it not enough just to love and serve Jesus? As I have argued elsewhere, yes and no. There is a place for solid theology and biblical studies. But few will take it very far, not even as far as I seem to be taking it. There is a larger gap, too, relating to the scholarship of the so-called ‘second world’ of Eastern Europe, and the so-called ‘third world’ which comprises most of the human race, including many of the most energetic (and sometimes the most persecuted) churches. We in the western academy have much to learn from other such readers, while they, for their part, might well wonder why they should need to learn from us. Those who read Paul in Africa, Asia and Latin America might glance at the discussions here in the way that I look at my neighbour’s beehives: there’s a lot of buzzing going on, I trust he gets some good honey, but I am busy enough with the chickens and the sheep, thank you very much. Worse: those churches may well come to regard our western preoccupations as simply another sign of our self-centred, self-serving arrogance. It would be nice to think that ‘post-colonial’ studies might lead to fresh openness to, and integration with, writings from outside the charmed western circle. I am glad he made such an admission about all this buzzing. Having said that, happy reading and happy studying. For those who do not believe in miracles – consider Paul once known as Saul of Tarsus was the first ANTI-CHRIST.